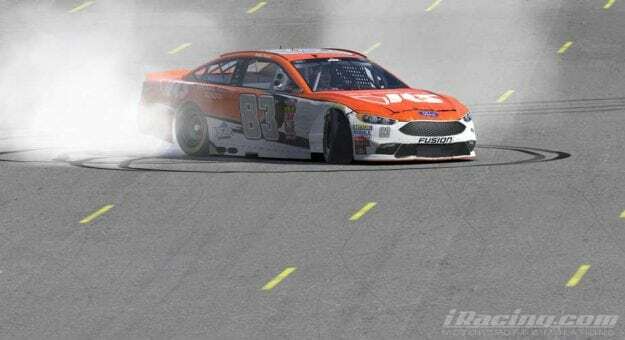 Bobby Zalenski put his road-course skills on full display Tuesday night, winning the NASCAR PEAK Antifreeze iRacing Series event at Sonoma Raceway for the second straight season. Zalenski started from the pole and led 52 of 55 laps on his way to victory. He never faced a serious challenge on track, as the three laps he did not lead were due to a pit cycle. Jarl Teien finished second, 4.5 seconds off the lead, followed by Michael Conti in third, 5.9 seconds adrift. Outside polesitter Alex Bergeron came home fourth after a late-race duel with Conti, and Jake Stergios rounded out the top five. Zalenski’s speed was simply too much for the rest of the field. After winning the pole by nearly three-tenths of a second, Zalenski jumped out to an early lead over Bergeron and looked to build a gap over the rest of the field. Sonoma is notoriously tough on tires and the searing track temperature made tire degradation even worse than usual. Passing was near impossible after just a few laps as most of the field settled into a single-file line. Zalenski wasted no time in attacking Tien to regain the lead once the pit cycle completed. He first attempted a pass heading into Turn 7, but Teien blocked him and, despite some contact, maintained the lead. Zalenski tried again the next lap, attacking under braking for Turn 11 and this time was not to be denied, giving Teien’s car a shove into the corner, pushing him wide to complete the pass. The contact knocked Teien wide enough he lost too much ground to return the favor. As the laps ticked down, the best battle on the track was between Conti and Bergeron for third. Conti had pitted a lap before Bergeron, which allowed him to return to the track ahead once both completed their stops. Bergeron, though, was quicker and, with the help of some lapped traffic, spent the last 10 laps of the race hounding Conti at every opportunity. Digging deep, Conti remained cool under pressure and denied Bergeron despite having a lap older tires and less pace. Missing from the action at the front was championship leader Ray Alfalla, who struggled all evening. Alfalla started a disappointing 22nd and his performance did not get any better in the race as he found it difficult to progress, coming across the line 24th at the checkers.